Time magazine have listed 200 candidates for their ‘Most Influential People of the Year’ award and you, the slightly less influential masses, have been voting for your favourites. So far, so good. To our great distress, we see that Idol reject/teen sensation Sanjaya Malakar (at #6) is beating Bono (#9) by more than 100,000 votes. This simply won’t do. 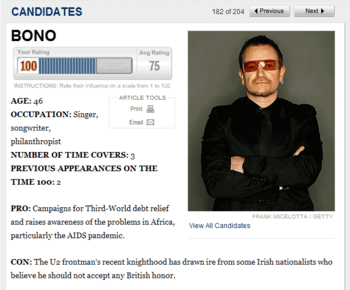 So if y’all could just go over to Bono’s profile, drag the slide all the way to the right until it says ‘100’ and click submit, please? Looks like voting’s been stopped. Performing in the Netherlands for the first time since 1996, Maria McKee seemed surprised so many had come out to see her. But the Paradiso staff had made their main room more intimate, putting tables and large plants down on the floor and moving the soundstage up a good way towards the stage. It was nowhere near sold out. She played all my favourites, even the oldies: Breathe, Dixie Storms, Shelter, Wheels… fabulous to hear them all again, as well as tracks off her new album ‘Peddlin’ Dreams’. Unpredictable and still slightly mad, she moves between folk rock chick, Carnivàle extra and Piaf-like little diva — talking to the audience about her husband Jim (on bass), listening to their comments (‘Who was singing along? I heard you! It was good.’), but never really making eye-contact. Eyes either closed or spread wide open, she lives the world she creates within herself. She even jokes about being a bit of a spacer. I’ve never heard her play the same song the same way twice and it seemed she was adlibbing to Wheels, lyrically as well as musically. Passionate and moody, she complained about the heat and muttered ‘and now I have to sing that song as well’ under her breath before delivering a moving ‘Worry Birds’. 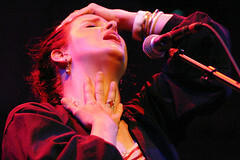 Ten years on (‘That like… a whole decade,’ she commented) Maria McKee is still absolutely barking stars. Setlist: You Are The Light, I Can’t Make It Alone, Am I The Only One, Peddlin’ Dreams, High Dive, Wheels, The Horse Life, Shelter, Turn Away, Sullen Soul, Worry Birds, If Love Is A Red Dress, Dixie Storms, Barstool Blues, People in the Way, In Your Constellation, Everyone’s Got A Story, Breathe, Life Is Sweet. Larry Mullen’s nominees for the Shortlist Music Project 2002 are up on the Shortlist website. Larry’s picked JJ72 (Larry buys Irish), Andrew W.K., Bjork, The Hives and The Doves.